18 August 2017 – Dig Delve – An online magazine about gardens, landscape, growing & making. The last week has seen a subtle shift, with a hint of the next season in the air. With cool nights and mist lolling in the hollows, the garden is between two seasons. The brilliant lythrum spires have finally run out of bud and, like sparklers fizzing their length, are suddenly extinguished. The dry days have been spun with the flock from the white rosebay willow herb caught on the breeze. I have planted it on the edges of the garden to blur the boundaries and, after weeks of flower, it is finally running to seed. I know it will need managing as it is a prodigious runner, but thank goodness it is not like our pink native Chamaenerion angustifolium, for the the seed is sterile. This week’s bunch is a push against this mood, which can all too easily descend as summer runs out of steam and autumn is yet to take over. Over the years I’ve learned to plan for the between seasons lull and now no longer fear it. The Angelica sylvestris is a perfect example of a plant that steps in to fill the gap. In the ditch where we have cleared the damp ground of bramble they are now seeding freely. Although this wetland native has been wonderful since the spring, with it’s coppery foliage and architectural loftiness, the month of August is really its moment. It has been all but invisible for a while, with the grasses staking their position earlier on, but now the pristine umbels are held amongst their spent, tawny seedheads. Some years, when we walk the ditch early in the season, you can spot a particularly fine form with dark, plum-coloured foliage. The dark stems are always a lovely feature of the Angelica but, coupled with dark leaves, they can not be bettered. Each year I mean to save seed of the best forms, but have never remembered to mark the plants before they are over and browned to skeletons. This autumn I plan to bring a selection called ‘Vicar’s Mead’ into the damper, lower slopes of the new garden. I have grown it without success in London, where it was too dry for it and mildew took its toll, but I trust the ground to be hearty enough here. Though biennial Angelica sylvestris will seed freely and, as long as you leave a number of seedlings, you will always get a succession. In the garden, I have a particularly lovely form of the perennial Angelica edulis, which is planted through the white Persicaria amplexicaule. 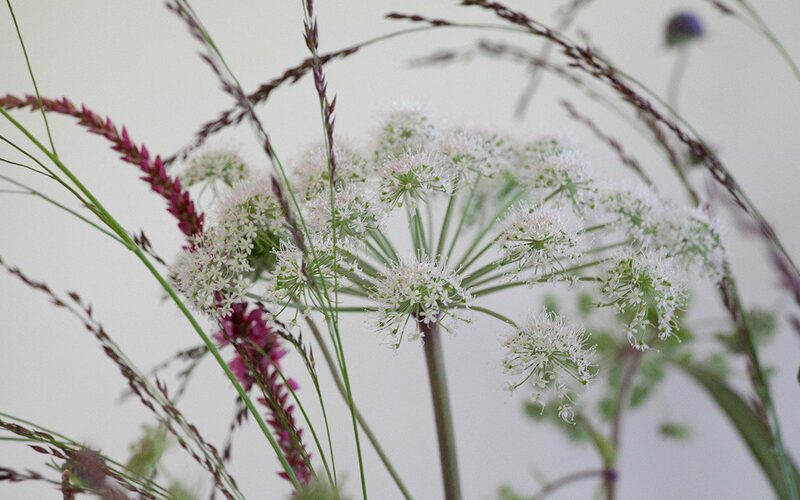 The substance and loftiness of the umbels with their horizontal conclusion is a good compliment to the finely drawn verticals, which echo the now spent grasses that surround the angelicas in the ditch. Persicaria is a mainstay of my plantings, which I have depended on for years. Happy with the cool of company at the root and with its head out in the sun, its lush foliage is an excellent team player. Good for the first half of the summer with its overlapping shield-shaped leaves, you know the season is progressing when the first spires arrive at the end of July. Again, August is their month, but they will sail through September and still be firing away in October with the asters. 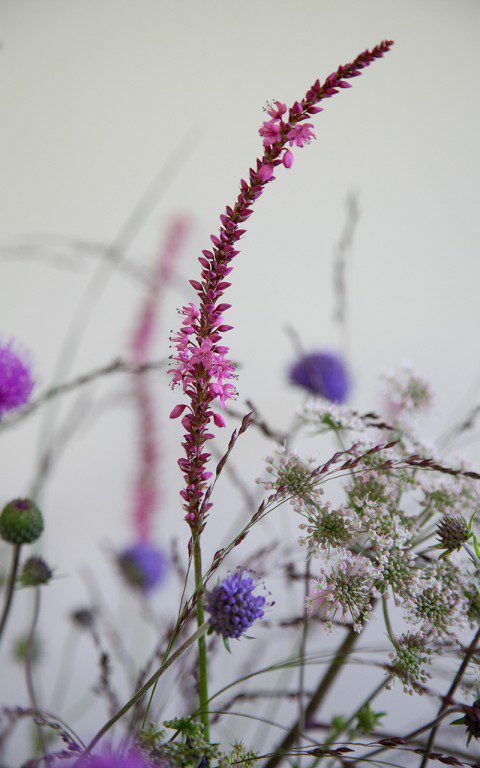 Here, for contrast with the blue, is a new favourite, Persicaria amplexicaule ‘September Spires’, which is tall enough to be making its way through the Verbena macdougalii ‘Lavender Spires’, and is an enlivening shade of hot pink. The Panicum virgatum ‘Rehbraun’ is a late-season grass. Slow to get started in the early summer and needing space early on so as not to be overwhelmed by early-into-leaf companions. 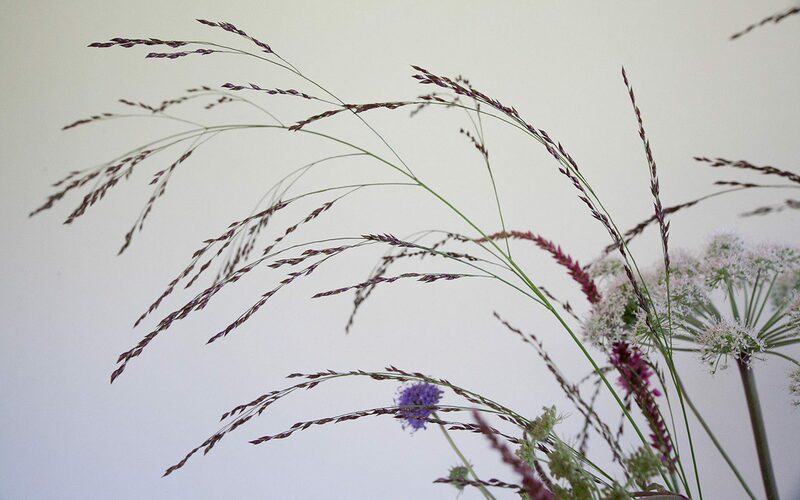 An American native known as Switch Grass, it is happiest on lean ground and in bright conditions. Here it is better in soil that is drier or it will lean and topple. I have it on the upper, free-draining slopes where it is already showing colour with reddened tips to the foliage. The plum-coloured flowering panicles are so fine and delicate that you can see through their dusky framework. By the end of the month they will ascend to a final height of about a metre and will then go on to colour brilliantly in October, fiery and lit with their own inner light it seems. I have them planted close, but not too close, to the Cirsium canum, which is as lush as the grass is fine. 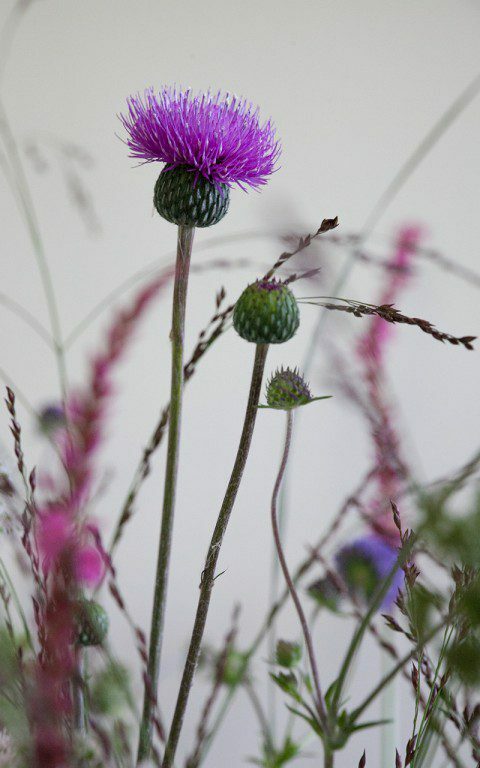 I bought this perennial thistle from Special Plants where Derry Watkins has it growing in her garden. She swore then that it wasn’t a seeder, as I had been stung by its similar cousin, the native Cirsium tuberosum. The latter has now been banished from the garden to the ditch banks for bad behaviour in the seeding department and, for the past three years, has been kept in check by the competition. When I last saw Derry and asked her if her C. canum had started to seed she said, “a little”, which was due caution, so I will raze my plants when the main show is over to avoid the inevitable. Their stature, reach and poise are beautiful though, the brilliant pink thimbles of flower spotting colour in mid-air just above our heads and humming with bees. 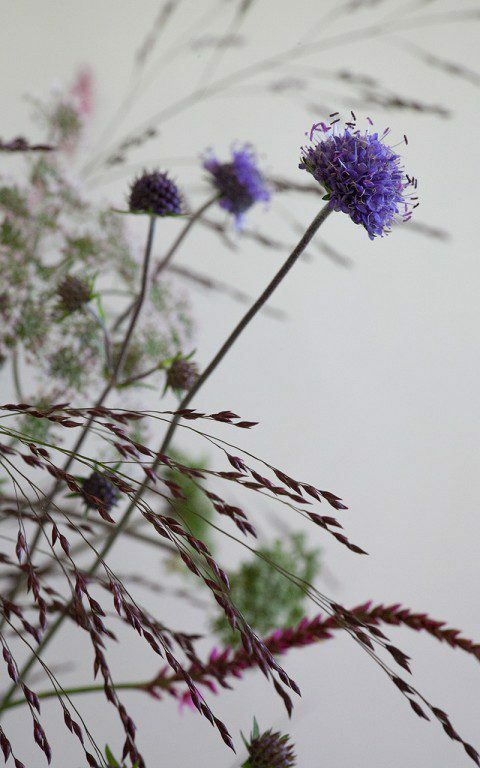 Though at an altogether smaller scale, the Devil’s Bit Scabious has a similar feeling in the suspension of flower on wiry stems. Another native, Succisa pratensis is a late-performing meadow dweller, happiest where the soil is moist and picking up where many other natives have gone over in August. My original plant, a dark blue selection called ‘Derby Purple’ was the parent of the seedlings in this bunch. They came easily from seed, germinating the same autumn they were sown and flowering just a year later in the new plantings. Although the flowers are darker than the native, they are not as rich as their parent, but they are a wonderful thing to have hovering around in this between season moment. A neat rosette of foliage, that will slowly increase and clump, is easily combined in well-mannered company. 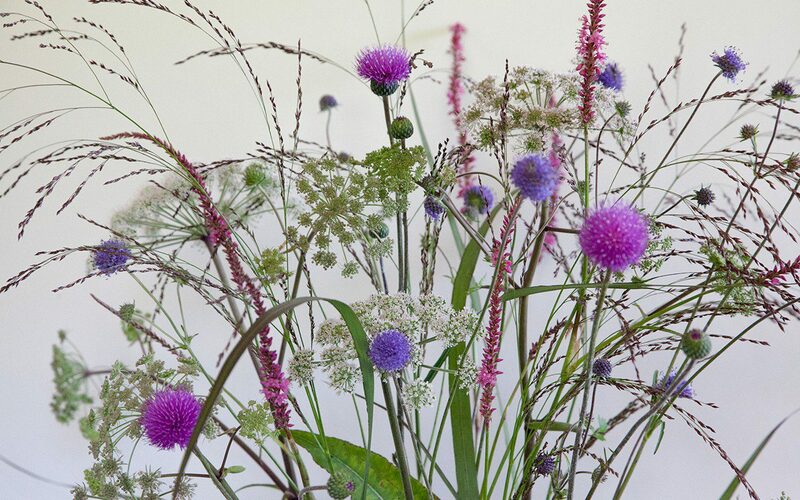 I will keep them away from the Cirsium and run them instead through the openly spaced Switch Grass and be happy in the knowledge that their contribution will help to bridge the season.